Welcome to our skischool here in Kaprun! Our service minded, hardworking instructors will make your winter holiday as good and relaxing as you want it to be! In our Skischool here in Kaprun we are focusing on the induvidual, specializing in private lessons and freeriding that are tailormade to the wishes of each client. We teach in Zell am See and Kaprun but also offer all our services in the nearby skiresorts. Let us share our passion for skiing by taking you to our favorite places. English, German, Russian, Czech, Dutch, Polish, Swedish, Danish AND Norwegian! Take advantage of our knowledge about the local area, restaurants, hotels, apré ski and other fun stuff. We are looking forward to seeing you here in Kaprun! Create your individual program together with your experienced instructor for faster and safer learning. Your personal instructor will make sure that your time on the mountain will be used as efficient as possible providing the right teaching methods and terrain for your ability. Learning with us is definitely gonna be fun! It is up to you if you want to be alone or with friends of your choice. Anyway it will make your progress faster than in a group. The Price is for up to 2 People. Don’t forget, you get -10% off all Private lessons every Thursday, Friday and Saturday! Are you also dreaming of the backcountry – wanting to make those perfect turns in the fresh snow? It´s not easy to find the best places – especially if you spend limited time in a skiresort. If there is powder, moguls or difficult snow we will show you how to master the skill – making your lines easier and better. Our experienced fully certified guides know exactly where to take you to get the best out of your level of skiing and keeping it safe. Avalanche safety material is a must! Helmet is a must! Back protector a plus! The maximum we allow are 6 People per Session. Rent the Avalanch safety material in our Office! Price per 1-2 people – excl. safety equipment. Discover the best slopes and some secret spots with our ski guide. Let us take you to the best places and nicest mountain huts. No teaching – only skiing! Suitable for first timers if you dont know the resort well enough to go on your own and for the ones that have been here a few times but want to discover the hidden secrets. It´s possible to see Kaprun, Zell am See but also other skiresorts nearby like Saalbach, Maria Alm, Bad Gastein, Kitzbühel etc. Also suitable for a mixed group of skiers and snowboarders. 5 Hours of Guiding per Day. The maximum we allow are 8 People per Group. Salzburg Super Ski Card required or buy a day ticket in the different resorts. I come from the Czech Republic where skiing is a very popular activity. When I started skiing together with parents and my brother I was around 3 years old and ever since we have gone skiing either in the Czech Republic or in the Alps. To be able to do this more often I decided to become a ski instructor. I did my first ski instructor exam while I was still studying at university. I spent a few winters teaching skiing and gathering experience in the beautiful mountains in Harrachov, Czech Republic. The last year at university I got an offer to work in Zell am See, Austria, and took the chance. After finishing my master degree in 2007 I made the decision to not follow this line of work but to spend more of my time in the mountains as a ski instructor. After meeting Jonas in Zell am See I ended up settling down in this area as well. It was so much fun to work together that we decided to open up this ski school. I think that you are a very lucky person if you can spend all day doing what you really love. Being able to share this passion with others makes it even more special! I am a very lucky person! My passion for skiing started at an early age when I got my first pair of skis. Ever since I was little we tried to find a good place to ski close to my home town. But being from Malmö, Sweden, this was not an easy task. This is why I finally ended up in Austria surrounded by these beautiful mountains here in Zell am See – Kaprun. 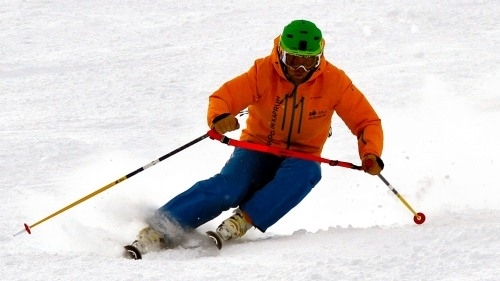 I have worked in this region since 1992 being in charge of different departments in various ski schools around. Working as a Snowboard boss and for many years in charge of one of the the Kids ski schools here in Kaprun. Moving on to being the Head instructor in Zell am See for a couple of years. Then again leading a Kids ski school here. Did my last exam in 2001 going on to the ski instructors part of the Mountain guide education right after. Fully certified as “Staatlich geprüfter Skilehrer und Skiführer” (the highest level of education in Austria + a little bit more) in 2002. I started working as an examiner teaching instructor courses here in Salzburger Land in 2005 and have succesfully done this ever since! It felt like I needed a new challenge and that is why you are reading these lines. I started this ski school together with my girlfriend Lucie and we hope to be able to make you and your families happy for many years to come! I wish you all happy skiing! PS. If you wonder what a skiinstructor does in the summer I can tell you. This one is White Water Rafting and Canyoning all summer long! I am the smallest one in the family. Some people would call me the ski school dog, but I would not agree. When they leave me alone in the office I am not always happy! Most of the time I sleep, but if it gets too boring I eat; Snowboardboots, Skipoles and other stuff that are laying too close to my nose. All prices in Euro incl. VAT. FROST – Your Skischool in Kaprun!